"I apologise personally to Mr Schäuble for calling him a dangerous mediocrity: arrogant, shallow, narrow-minded, provincial, and unscientific in equal degree. This was shockingly rude. It brings shame to Fleet Street." Five years ago Austria's most loved and hated politician of recent years Jörg Haider met his death at the wheel of a two ton car on a bendy road. The work of a Mossad death-squad, I was told by an Austrian academic earlier this year, using a laser beam to blind him. And either his drinks were spiked, or the female Mossad agent who checked his body for signs of life immediately after the crash, called 911 then disappeared never to be found, injected alcohol straight into his veins. This seems quite a popular opinion in Kärnten, whispered or spoken sotto voce rather than proclaimed. That Haider was an extremely corrupt politician there is no doubt; mafia money as well as millions from Saddam and Quaddafi. That Israel saw him as a threat and had him tracked is also no secret. And like the death of David Kelly there are many unanswered questions and the certainty that the government know more than they're saying but I'm not convinced of the assassination theory. I don't dismiss it, I just regard it as of equal probability as the McCanns having murdered their own daughter. Africa south of the Sahara has a population of about 812,190,818 at 2010 levels according to the World Bank, and rough annual mortality rate of 12.6 per 1,000. That's about ten million deaths every year. A quarter of those deaths, some 2.5m a year, are of children under 5 years. Of that 2.5m, 1.1m children under 5 die in Nigeria alone every year - that's over a thousand times the number of Africans dying from immigration attempts from just one nation alone. Most of the rest die in the age group 20 - 45 years; death from old age is not the norm in Africa. In fact, if one uses South Africa's mortality causes as a guide, some 8.9% of those 10,000,000 deaths a year in Africa are caused by 'External causes of morbidity and mortality' - which includes everything from being eaten by a crocodile to being shot by bandits. Including drowning when a leaky boat sinks. That's about a million Africans a year, of whom only a thousanth or 0.1% die while attempting to enter Europe. A thousand accidental deaths a year are sad but in statistical terms insignificant - I'll bet a thousand Africans a year die from Scorpion bites, but I can't see Mr Hodges campaigning to Kill the Scorpions. A thousand more may be trampled by Zebras, but Hodges isn't out there installing special road crossings for these animals, nor is he fitting Hippos with muzzles or castrating boy anopheles mosquitos. In fact the whole piece is just an empty piece of puff, of drivel, of uninformed vacuousness. If Hodges actually really cared about African lives rather than making socialist points, he'd start with those 2.5m infants dying every year. That infant mortality rate is the reason so many Nigerian village girls want to have their babies safety, in the maternity ward of Mr Hodges' local hospital. As a schoolboy, once a year I was tasked with negotiating the donation of 'surplus' tins and packets from the family store cupboard to a hoard which the school then parcelled out to needy pensioners. As my mother had the food-acquisitive habits of a squirrel with OCD this was not always easy; if I managed to come away with a small jar of home-made tomato chutney from the Suffolk Chutney Mountain, an egg-sized jar of fish paste and a tin of processed peas it was a win. Some parents regarded it as a status contest and donated tiny tins of salty anchovies or jars of cocktail cherries or of Marrons glacé, and sometimes these luxuries were snaffled by the staff, who diligently swapped them for tins of processed peas. And later we suspected that many of the needy pensioners were not the retired sons and daughters of artisan toil but the school's own retired teaching and domestic staff - an annual gift of two dozen assorted tins being cheaper than a proper pension. Well, I suppose it kept the fees down. Sometimes the old dears hit lucky with a tin of pineapple chunks, but generally what they got most of was processed peas. I must then have regarded retirement as a bleak period of life marked by smelly trousers and enlivened only by fish paste and processed peas; this was the 70s after all. And now we have news that the Red Cross is to distribute food parcels across the UK not just to needy pensioners but to needy asylum seekers and needy normal people who just can't manage their money. I, for one, stand ready to contribute; since I found two tins of processed peas at the back of the cupboard both price-marked 12p and both still remarkably in date I've been wondering what to do with them. In the absence of a nuclear attack eating them myself is not an option. I now have the answer - and will even in future keep an eye out for long-life fish paste. Back to the seventies isn't all bad, y'know. A squirming BBC had its nose rubbed in the results of an ICM poll yesterday that showed that the public reckoned that nearly all public services had improved since the austerity cuts. In justification of its own income, including the hated TV tax, the BBC has long argued that any cut in income will lead to a loss of quality output; now it is faced with adopting a model that means that ordinary people will actually rate it better if its income plummets. Quite why this should be I don't yet know; perhaps the parks, libraries and leisure centres showing such a marked improvement sacked their Guardian-hugging managers as an early first step, thereby immediately improving their efficiency? And could a mass-cull of middle managers at the BBC produce similar results? A piece by Matthew Lynn in the Speccie explains, slightly tongue in cheek, why Britain's economy will overtake Germany's - population growth, and we're not in the Eurozone. The UK's population growth isn't of course a matter of unalloyed rejoicing - fuelled by immigration, and without the schools, hospitals or housing in place to support it. But still. If Generation X needs a future young workforce ready to wipe its geriatric bottom I don't suppose it matters if the bottom-wipers are Nigerian PhDs or Cockney graduates. A strong £ against a weak € will make trade in Europe hard for our manufacturers, but offers the EU a lucrative export market; weak BRIC economies will curtail German export growth focused on them. European capital will want to invest in UK business and all together the UK starts to assume a much more dominant position in Europe's hierarchy - sharing the top table with Germany within five or six years, with a widening gap between us both and France and Italy beneath. Cameron is relying on this change of fortune, I think, to give substance to 'renegotiation' - that the UK and Germany together, for very different reasons but both dealing with domestic political pressures, will act in concert to change the commitment to 'Ever Closer Union'. North remains convinced that 'out' is the only way and he may well have the right of it - but with the UK increasingly more important to the EU than the EU is to the UK, it leaves us with some intriguing options. 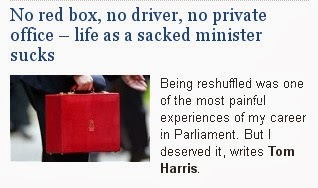 Who is Tom Harris and what is this drivel? Who is Tom Harris? I've never heard of him, and I'm better informed than the average bear. Whoever he is it seems he has a high enough opinion of himself to imagine that he merits a piece in the Telegraph (£) and it seems someone in the Telegraph's editorial department is deluded enough to waste print space on an unknown non-entity. No, I haven't read it. Life is too short for such drivel. If anyone can, in the comments, and without recourse to Wikipedia, quote one single improvement to my life that this man has secured I'll send them a banana. First the EU came up with an energy strategy so utterly away-with-the-fairies, so holistically fantastical and so completely unrelated to anything remotely achievable that one suspects it was the work of some adolescent wunderkind from the Berlaymont who had been weaned off his Lithium. Europe would be powered by the Sun and the wind, it stated; we must all throw away our coal-fired power stations and build bloody windmills across the continent. Then came Labour. The party that destroyed the economy, realising that windmills can't vote, preferred to throw money at GPs, Council bosses, fake charities, Common Purpose members and anyone who could, with the result that although they'd complied with closing the coal-fired power stations, they'd put nothing else in place. In 2010 the situation was reversible. Just. The Conservatives could have reversed the closure programme, declared a dependence on windmills as nuts and secured the immediate letting of construction contracts for new nuclear at the existing nuclear sites. But they failed to act and even promoted more bloody windmills to be built at great cost by their chums. So this Winter we face power blackouts - an advanced Western nation without any fuel shortages, with some of the highest electricity bills in Europe, with an advanced distribution network in good condition. And if we get power blackouts, some of the very vulnerable - the young, the old - will die. And it will be the fault of those unelected clowns in Brussels, Blair and Brown and that Stupid Boy. Remember Sid? Sid was the apotheosis of Thatcherite corner-shop capitalism, launched in the privatisation of British Gas to offer small share ownership to parts of the population who had never before owned shares. For a brief heady period white van man would check the financial pages of his paper before the sports section to see how his £250 shareholding was doing. On the back of it, the UK gained another ten thousand entrepreneurs, another ten thousand risk-takers, eroded the bars to social mobility, advanced equality and challenged Labour's leadership of the working class. So you'd think the Royal Mail privatisation would be embraced with both arms by Cameron's embattled party as an opportunity to repeat the trick, no? No. The privatisation is being run by Cameron and Osborne's chums Goldman Sachs, whose brokers will fund their yachts and grouse-shoots from the fat fees. And they've decided that the benefits of the privatisation should be restricted to their chums - bankers, large multinational corporations and the like. So they've restricted the sale of 70% of the RM shares to the Tarquin list - leaving Sid to scrabble about for the remaining 30%. It's like a slap in the face with a wet fish for popular capitalism and a gift for Miliband. When will the Tories ditch that damned useless boy?